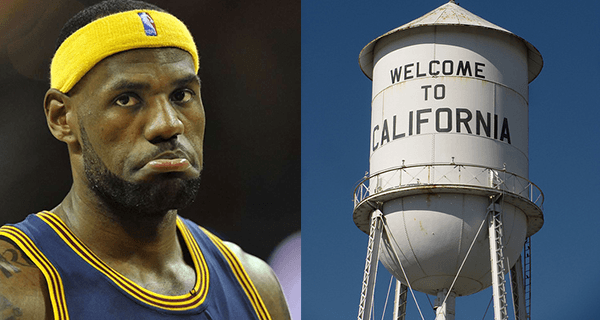 Adding insult to injury after the Cavaliers’ defeat in the NBA finals, California governor Jerry Brown requested that LeBron James allow the state to harvest his tears. The recent drought has caused the state government to crack down on wasting water, and environmentalists identified James’ despair as an opportunity they simply couldn’t pass up. Later that night, a team of technicians arrived at James’ hotel room with a funnel, a bucket, and video footage of the game. While the athlete’s initial tears produced enough water to lift the state ban on ornamental grass, the governor was able to tap James for more by yelling insults. Among the top-yielding were “Wow, 2-4. Was it really worth leaving Miami?” “Might as well get an early start on that baseball career,” and, “I hear Tampax wants you for an endorsement deal.” This led to the production of enough water to hydrate the 50 million lawns that would have been replaced with AstroTurf otherwise. In one last effort to remove all possible moisture from James’ eyes, governor Brown invited Andre Iguodala into the room to show everyone his Finals MVP trophy. This proved to be the most effective, yielding the final amount the Golden State needed to go back to normal farming. Looking for more of sports fallen heroes? Check out Aaron Hernandez Signs 4-Year Contract With Nuestra Familia.